During the tidal storm of 3rd and 4th January 2014, a breach in the front of the sea wall below the Bathrock shelter revealed the remains of basement walls relating to a historic bath house. The Marine Baths were built in 1810 by Doctor Rice Williams at the north end of Marine Terrace. By this time salt water bathing had acquired a reputation for curing a wealth of medical ills, and bath-houses were being built for those who did not want to or could not brave the open sea. 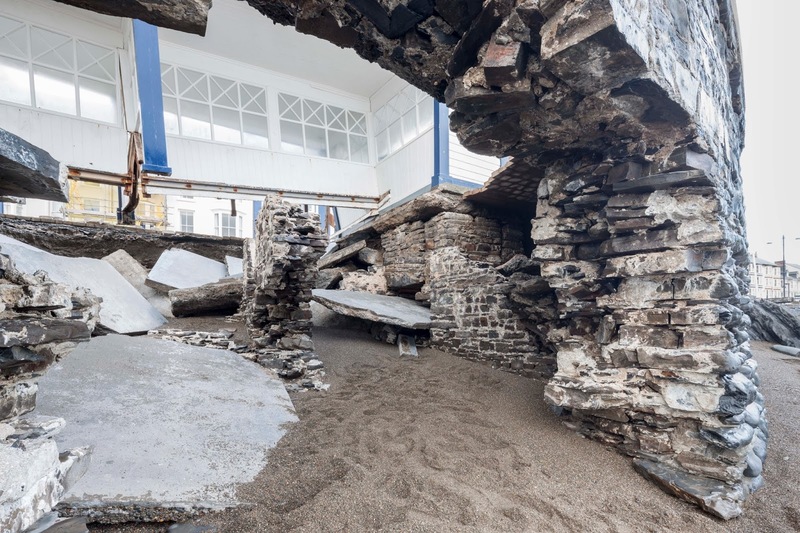 Within the bastion of the promenade wall, the remains of basement walls belonging to the Marine Baths have been revealed. 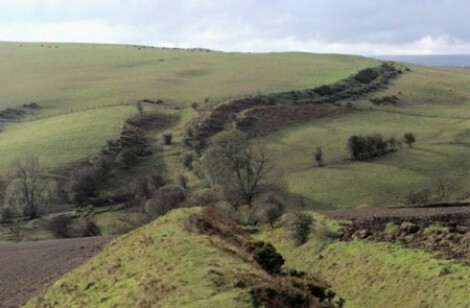 Cast-iron pipes ran far out into Cardigan Bay to ensure a supply of clean and sand-free saline water. Basement boilers heated the water for those wanting baths of a less invigorating nature. 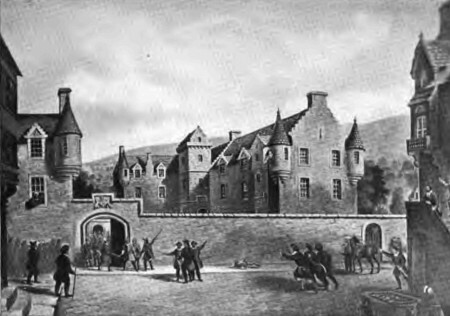 There are two accounts of the Gowrie Conspiracy, the events of the fifth of August 1600 that resulted in the deaths of the third Earl Gowrie, John Ruthven, and his brother, Alexander Ruthven. The ‘orthodox’ version, essentially as presented here first of all, is written by Robert Chambers (1802-1871), and based primarily on the testimony of King James VI of Scotland, whose life was allegedly threatened, and the alternative, here summarized by Rev. 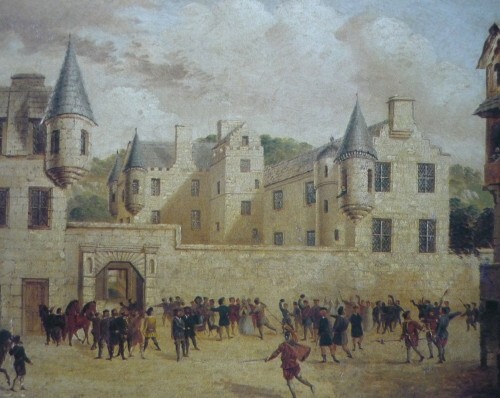 Alexander Duff of Tibbermore, in Memorabilia of the City of Perth (1802) , and presented in Samuel Cowan’s book, along with three other papers, believed by many, especially in Perth, that the king himself conceived the circumstances of the plot for his own ends. To hold such a view at the time was to invite an accusation of treason, punishable by death, hence all the more remarkable that the alternative accounts persisted from the start. Compare these accounts for yourself..
What is the truth about England and Wales? Continue reading What is the truth about England and Wales? Were the ancient British tongues related to Hebrew? At present, Welsh is spoken only in Wales, and Breton in Brittany, yet there was a time when it was spoken not only over the British Isles, but over parts of Continental Europe. For it has been maintained, falsely in my view, that the Celts, or ancient Gauls, were one and the same with the Britons, and making allowance for dialect, used the same language. Although most modern researchers deny this, the widespread knowledge of early Welsh must hold true. Very many of the Celtic or Gallic words agree very well with the Welsh, both in sound and in sense. In addition, many of the names of cities, mountains, rivers etc. 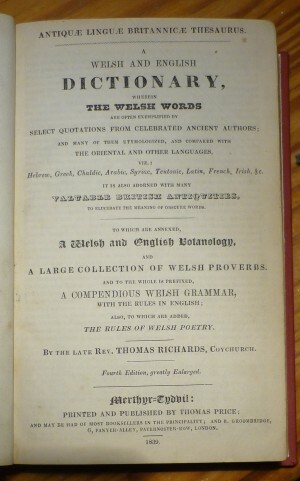 in France (anciently, Gaul), cannot be accounted for without a knowledge of Welsh. Here are a few examples. Arles (Latin: Arelatum) derived from Ar (upon) and Llaith (moist); because situated upon moist ground, Ysloudun, Guienne (Latin: Uxellodunum) derived from Uchel (high), and Din (fortified mound). The Cevennes comes from the root Cefn (back or ridge), and the Apennine mountains, Pen (head, top or chief, etc.). The river Arar, in French, La Saonne, from Araf (slow, soft), the Garumna, now called La Garronne, from Garw(rough, harsh)” (Thomas Richards’ Welsh &English Dictionary (1839). Continue reading Were the ancient British tongues related to Hebrew? It is often said that any persons who cannot accept the Trinity doctrine, common to Catholicism, Orthodox and most denominations, are not Christian. Since even before Nicea (325AD) however, there have always been outspoken individuals who rejected it as unscriptural, and often suffered for it. In the eighteenth century, a time of ferment in the history of Welsh faith, such a man was Peter Williams. 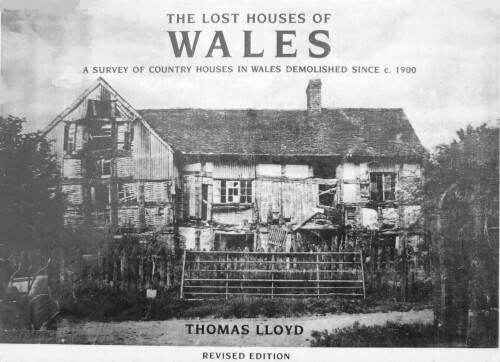 In addition, Peter Williams knew that Bibles were financially beyond the reach of most families and that, in any event, Welsh Bibles were virtually unobtainable. 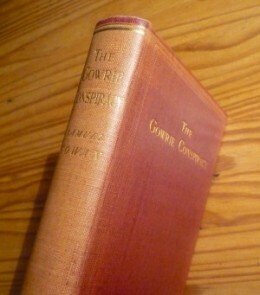 He was also aware that his own fervor for spiritual knowledge was shared by increasing numbers of the ordinary people of Wales, but that the copyright for publication of the Bible was held by the Universities of Oxford and Cambridge, which made accessibility even more difficult..
Britain owes a debt to the Irish navvy, the migrant labourer willing to do the back-breaking shovel work others baulked at. By the 1970’s there were over 200,000 of them. 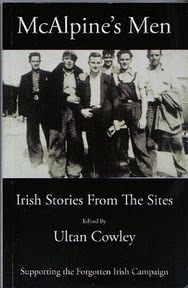 Nobody has done more to document their cause than the author Ultan Cowley, who wrote the definitive book on the subject called The Men Who Built Britain: A History of the Irish Navvy (2001). The book stripped away decades of ignorance about the Irish navvy. It also forms a fitting memorial to a race of men whose contribution to British society, especially during the post-war construction boom years, has for too long been undervalued. The term ‘navvy’ originated with the building of the 18th century canals, the ‘inland navigation system’ in Britain. The diggers became known as ‘navigators’ or ‘navvies’. The pioneering construction methods of these canal builders were then adapted by the railway engineers and the excavators who, working on this new transport system, kept the name ‘navvies’. Post-world war two, the new generation of Irish immigrants who worked on the construction of the motorways, hydro-electric schemes and other massive civil engineering works were given the same name. In this way, the word navvy became synonymous with Irish migrant labourers, the ‘heavy diggers’ who came to dominate the ground-works aspect of construction in Britain..
A ferry stranded off the north east coast of Scotland, the Hjaltland, coping with “atrocious” high seas, has docked in Fife after more than a day (actually 31 hours) at sea. Strong winds left 87 people stranded on the NorthLink passenger ferry. The vessel was supposed to dock in Aberdeen at 0700 GMT on Monday 08/11/10, after travelling overnight from Shetland. It finally arrived in Rosyth at about 0115 GMT on Tuesday (18 hours late) after a decision to take the ferry 100 miles south (Source: BBC news 09/11/10). 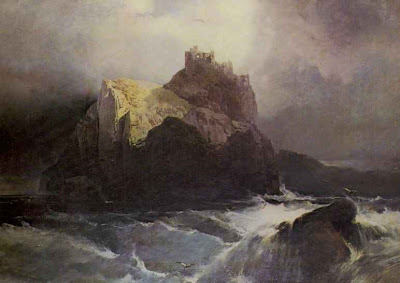 Recent storms are a reminder of how Scotland’s northern waters can be amongst the most treacherous in the world. Makes the achievements of the Vikings even more remarkable. They probably spent the winters indoors though! Don’t let the winter weather put you off a visit. 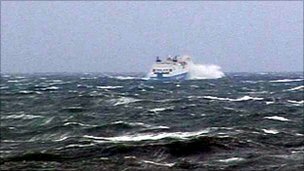 Here are a couple of stock photographs from www.northlinkferries.co.uk for those who have never sailed out of Stromness (Orkney). Try and go there one day! A Fleet Street reporter, H. V. Morton (1892-1979) fought in the First World War and was in Egypt in 1922 at the opening of Tutankhamun’s tomb. One of the century’s most popular travel writers, he wrote books about Spain, Italy and the Middle East as well as the famous ‘In search of..’ series on the British Isles. Something to remember about Morton’s book on Ireland is its historical perspective. In Search of Ireland was first published in 1930, which was a few years after Ireland had become a Free State in 1922. Morton is seeing Ireland in the early stages of independence separated from Britain. He warns the English in his introduction, “We must forget the hosts of prejudiced ideas about her which have accumulated during centuries of strife and misunderstanding…I must stress the point that the new generation of travellers must approach Ireland with the feeling that it is a foreign country.” I could not help but reflect on the history he refers to, when England was so often the aggressor, and Ireland the betrayed. 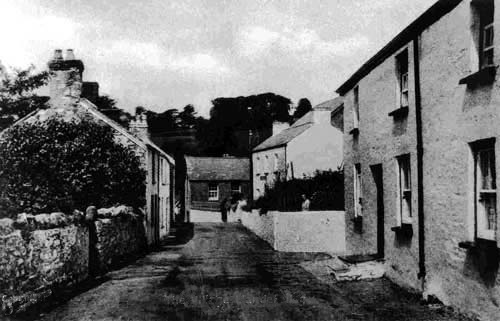 Sometimes it seems he relates the events connected with a place without examining the underlying issues, he observes the empty cottages with hardly a mention of the famine or the forced evictions, or that emigration was so often not a choice, but a matter of survival. Nonetheless, Morton’s humorous and insightful observations about Ireland, as a traveller in a foreign land, are worth reading and re-reading. “Dublin in the early morning, with the sun shining, is a city the colour of claret. 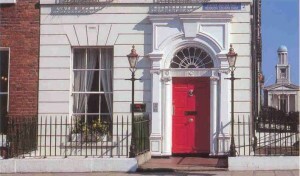 The red-brick Georgian mansions, with fine doors, fanlights, and little iron balconies at the first-floor windows, stand back in well-bred reticence against wide roads, quiet and dignified, as if the family has just left by stagecoach.” Prose of this quality is what raises travel writing to literature, and Morton’s skill as an evocative writer is worthy of the best of his era. In explaining about the Book of Kells, which is kept in Trinity College, Dublin, he says that during the three darkest centuries of English history it was Ireland that was saving Greek and Latin for Europe..